When I first visited The Lodge a couple of weeks ago (view my review on their dinner menu here), I had the opportunity to view the brunch menu and I vowed to come back to try it. I was so impressed with the dinner we had, that I figured the brunch would be just as great. Guess what? I was right (of course). We arrived Sunday morning for brunch and with a recommendation to try the Maxmosa, a large mimosa with champagne filtering into it, it was my first order of the day. Have I mentioned my love for champagne? While I would definitely appreciate a "normal" mimosa, I chose to get it in strawberry. Passionfruit, Peach and Mango are also available. This drink was so refreshing and I enjoyed it through my entire meal. The Maxmosa being a signature drink, I highly recommend you order it! Next, with recommendations from 2 managers, my table ordered The Monterey Hash, Lodge Queso Benedict and NYC Pretzel French Toast. The Monterey Hash was, in a word, delicious. 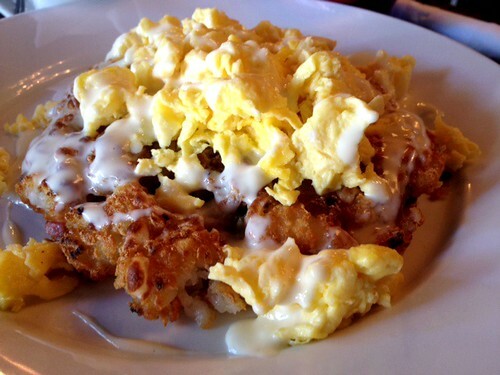 It is a tater tot hash with onions, bell peppers and monterey jack cheese, topped with two eggs any style (we chose scrambled). The eggs were fluffy, the hash was crispy and everything was flavored great! I already knew that the queso was great from a previous visit so I figured I would love this dish. 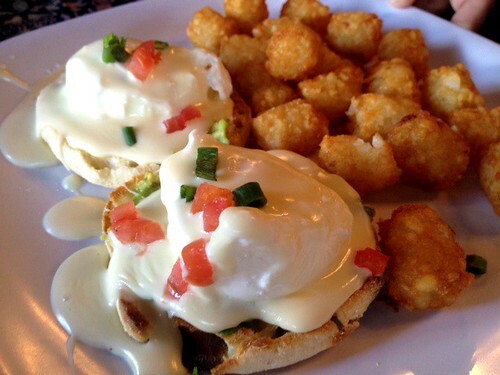 The Lodge Queso Benedict is composed of a crisp English muffin, fresh avocado and 2 poached eggs, drizzled with queso. This dish seems simple enough, but the flavors and combination of all the components make it a refreshing delight. The NYC Pretzel French Toast is something I had been thinking about since first viewing the brunch menu. It was every bit of the perfection that I thought it would be. A street-style NYC soft pretzel, stuffed with sweet cream cheese and then prepared like the traditional bread french toast, this was my favorite dish of the morning. The pretzel was large and both sweet and savory. I'm glad someone thought of a dish like this! I'll be raving about it to everyone I know. The cream cheese was definitely noticeable, but not at all overpowering. The accompanying whipped cream and strawberries were a nice addition. I chose the Home Fries as a side with my meal. The Home Fries were pretty much devoured by us in no time flat. 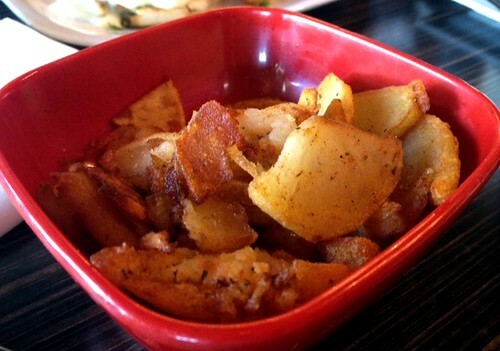 With a nice mixture of soft and crispy, the potatoes were also perfectly seasoned. As with lunch and dinner, there are Lodge Specials during brunch. 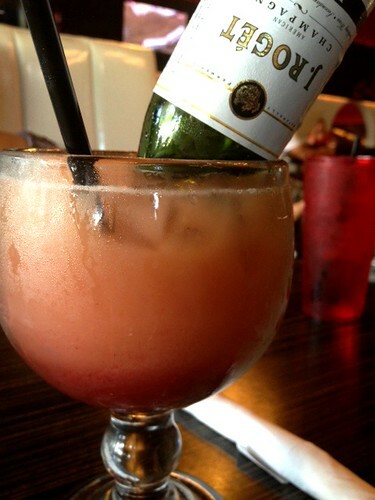 You can take advantage of specials on Mimosas and Blood Marys, among other items. 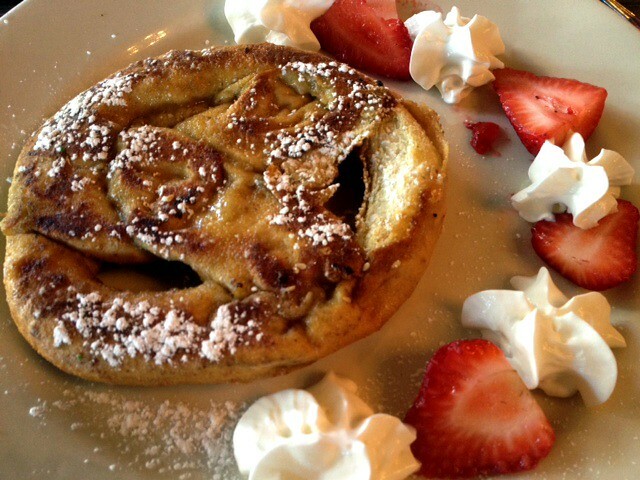 Brunch is served until 3pm. During brunch hours, there are also a large number of lunch items available. Live music can be heard on the patio. There is no doubt that I'll be back for brunch many times over. Next time, I plan on starting with a Strawberry Basil Mojito and ordering the Eggs Rancheros (2 eggs any style with Turkey Chili, Queso, Ranchero sauce and fresh Guacamole, served with tortilla chips) or the Banana Stuffed French Toast! you're making me so hungry. wanna go saturday?!?! Ohh My, I would pretty much kill for that Pretzel French Toast right about now. I have to visit soon! Very pregnant and very hungry...Clearly I should not have read this post. Haha! Yum! I'd order the banana stuffed french toast. Mmmmmm. Clearly I missed the giveaway before. Ha! Preggers brain.